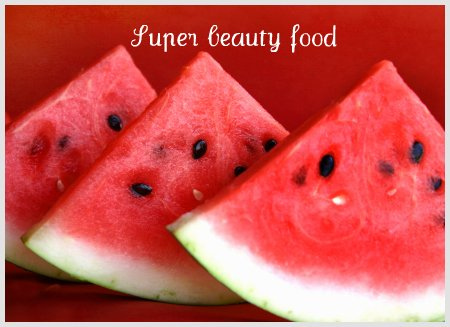 Glow a healthy pink with luscious watermelons!! Luscious Watermelons are simply super beauty Food for your skin& excellent summer coolers as well!!! Red juicy watermelons can combat ageing due to damage from free radicals with its high antioxidant Lycopene and vitamin C content,and act as a perfect skin toner.They contain 92 percent water, which makes it a cooling low calorie summer drink&ideal to curb sugar cravings as well. A few slices a day of luscious watermelons can give you a youthful complexion as they are a storehouse of powerful antioxidants like lycopene which gives watermelon its attractive red colour,and vitamin A and C.The yellow-orange varieties,contain citruline,an amino acid credited with helping skin’s healing and regenerative processes,and delaying ageing. Purée watermelon chunks in a processor or blender. Strain the liquid and discard the solids. Mix the strained liquid with the remaining ingredients, stir and pour into a glass bottle. Dab on face using a cotton ball. This is rich in sugar and vitamins A, B and C. Watermelon has astringent properties, and the super high water content makes it an excellent skin refresher. 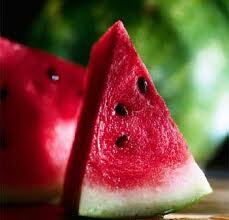 So go on ahead pamper your tastebuds and skin with the refreshing luscious watermelons!! !